This is indeed an indispensable document for all Klemperer aficionados. It is intriguing to note the tightness and grip that Klemperer managed to achieve with any orchestra, not least this fine Danish instrument. The 'Leonora #3' is particularly exciting for its grand titanic opening and the irresistible surge as the main theme develops in triumph. Playing is also fantastic, especially the strings who are top notch in all departments. The Mozart symphony was a typical Klemperer favourite and here it is quite interesting to note the subtle differences between this and the studio recording (also available on Testament). I would be wont to prefer this version for more visceral excitement. The Brahms Fourth is also masterly from beginning to end with a superb Passacaglia that almost brings the house down. Again this is preferable to the more marmoreal studio recording. 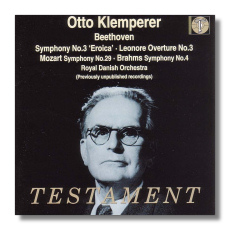 The second CD is devoted to a stunning performance of Beethoven's 'Eroica', always a Klemperer speciality and here sounding even more brilliant and propulsive with a superb Funeral March. To sum this superbly annotated issue is an essential companion to Klemperer's legacy of studio recordings and offers us fresh and exciting live performances that are a joy to those who could not hear the magic of this conductor in concert.